As part of its energy from renewable sources strategy, the Brazilian government is planning to build 10 hydroelectric power stations that will possess a combined generating capacity of close to 4,000 Mega Watts. As part of its energy from renewable sources strategy, the Brazilian government is planning to build 10 hydroelectric power stations that will possess a combined generating capacity of close to 4,000 Mega Watts. The largest of these, Teles Pires, is located near the town of Paranaita, and when fully operational in 2015 will possess a total generating capacity of 1,820 MW. The hydroelectric project has seen Sandvik Construction in Brazil play a key role in ensuring the Teles Pires deadline is met through the supply of a large variety of rock tools, drilling equipment, all backed by Sandvik’s world leading aftermarket customer care. The Teles Pires Hydropower plant has been built on Teles Pires River, a 1,370 km long water course in the Mato Grosso State. When fully operational it will generate around 1,820 MW, and will be the largest hydroelectric plant of the ambitious Teles Pires Complex. The combined complex is located between Paranaíta in Mato Grosso State, and Jacareacanga in the Pará State, all located inside the Seven Fall Waterfall area. The entire Teles Pires hydropower complex consists of the São Manoel Hydropower, Sinop Hydropower and Teles Pires Hydropower. Four further smaller power plants will also be installed on the Parnaiba River, located on the border between the north eastern states of Piaui and Maranhao, while another will be situated on the Sao Francisco River situated between the Bahia and Pernambuco states. The two managing concerns for this strategically vital project are Empresa de Pesquisa Energética (EPE), which is the agency of the Brazilians Ministry of Mines and Energy (MME), and Neoenergia Investimentos S/A (Neoinvest). The latter is a company controlled by pension funds linked to the Brazilian state-owned Bank of Brazil (Banco do Brazil), and the Welfare Fund for Bank of Brazil's staff (Previ), as well as by the Spanish group Iberdrola. Neoinvest has thus played the central role in ensuring that the project has been suitably financed. Due to the prominence of the project, and the strategic role it will play in securing Brazil’s current and future energy requirements, it was no surprise that some of Brazil’s leading specialist construction and civil engineering companies combined to work on the scheme. These major companies included such established names as Odebrecht Infraestrutura, who were responsible for the construction of the hydropower facility, and Intertechne Consultores Associados S/C Ltda. 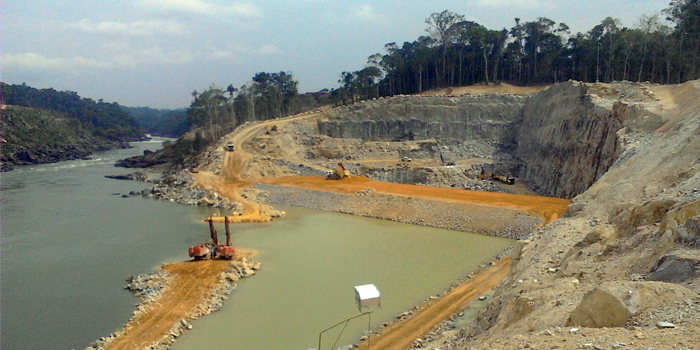 Additionally Empresa de Pesquisa Energética (EPE), Neoenergia Investimentos S/A (Neoinvest), Neoenergia, Eletrobrás, Eletrosul, Eletrobrás Furnas, and Odebrecht Energia all played significant roles in the construction of the Teles Pires hydroelectric project. Playing a vital role from the very beginning of the project has been Sandvik Construction Brazil, who first became involved towards the end of 2011 when building work commenced. Sandvik’s involvement stems from the winning of the contract to supply rock tools for surface and underground drilling. This is hardly surprising as Sandvik provides the world’s widest range of tools and accessories for exploration, rock drilling, raise boring, coal and mineral cutting, tunneling, trenching, road grading and cold planing. Furthermore, quality is imbued into the equipment as Sandvik is a world leader in steel, hard-materials technology and tool design. Thus Sandvik products are renowned for quality, high performance and the lowest cost per unit of work performed. The requirement for rock tools of the highest caliber cannot be over stated due to the hard wearing nature of the granite material that was encountered, as well as the isolated geographic position, which necessitated the use of highly reliable tools. Furthermore, as the scheme is divided into 2 parts - Left Border and Right Border – two different approaches were required both requiring their own specialist equipment. The Left Border of the scheme has seen 2,500,000m3 of material excavated, and such an enormous quantity of material thus required a large number of specialized machinery to be utilized, with the rock blasting alone having seen 5 x Pneumatics Drill Rigs, 2 x Hydraulics Drill Rigs, and a Jumbo Sandvik Axera T08 used. Getting the choice of the range of rock tools right used in this drilling was essential, as this part of the scheme possessed an added complexity as the river would be deviated from its course, with three 330 meter long tunnels totaling 220,000m3 being excavated. On the corresponding Right Border a staggering 4,500,000m3 of material has been excavated, with the materials being used to provide rock for barrage construction. The equipment used to help excavate the material on this part of the scheme used 5 x Pneumatics Drill Rigs, 8 x Hydraulics Drill Rigs and 5 x Hydraulic Drill Rigs DX 680. In addition to drilling equipment supplied by Sandvik (that was also used in a nearby project), a great deal of specialist rock drilling tools were specifically deployed. To this end Sandvik supplied tools, shank adaptors, couplings, rods as well drill bits for the hydraulic and pneumatic drilling equipment. These tools used are particularly worthy of note due to the key part they played in the successful completion of the project. The New Sandvik Tough MF rods have been specifically developed for surface bench drilling, in order to provide users that extra edge. With metallurgical properties varied carefully to match the load on different zones of the rod, they possess no weak points, resulting in a rigid, long-lasting and highly productive drill string. The Sandvik Alpha tools have been developed due to the problems associated with persistent tool failure in drifting and tunneling. As these problems may seriously affect productivity the Sandvik Alpha counters these problems as it is a new drill string, designed to take the high energy output and very high penetration rates of modern hydraulic rock drills. Thus, both sets of tools were perfect for the difficult conditions encountered on the Teles Pires scheme. Sandvik’s role was not limited to purely supplying rock tools, as parts, aftermarket and logistical support were also key strategic areas of Sandvik’s involvement. Based on expected usage, and drawing on its world leading experience of such projects, Sandvik put together consignments of rock tools. This was done to ensure that productivity would not be affected by any unforeseen problems with production, as the logistical situation was incredibly difficult. This is due to the physical location of the site making reaching an arduous task, as it is located in the heart of the Amazon Jungle, with poor roads at the best of times that became virtually non-existent during the rainy season. Furthermore, and in order to ensure that the very best results were achieved from the rock tools utilized, a monthly visit from Sandvik specialists to help ensure that the very best solutions were used was organized. This proved especially beneficial due to the difficult nature of the granite encountered, and thus unforeseen difficulties encountered. The Teles Pires hydro-electric scheme has been a vast undertaking; located in some of the world’s most demanding terrain, requiring the excavation of some of the hardest wearing rock, it has been a major test of both man and machinery. Sandvik tools and drilling equipment have proven their worth yet again, and have contributed to the project being completed on time, and will ensure that the hydro-electric scheme becomes fully operational in 2015. Sandvik is a global industrial group with advanced products and world-leading positions in selected areas – tools for metal cutting, equipment and tools for the mining and construction industries, stainless materials, special alloys, metallic and ceramic resistance materials as well as process systems. In 2012 the Group had about 49,000 employees and representation in 130 countries, with annual sales of more than 98,000 MSEK. 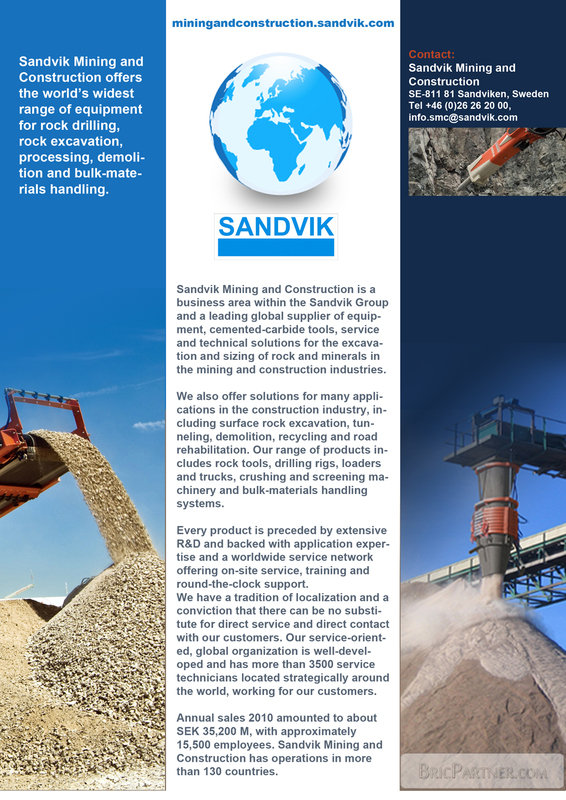 Sandvik Construction is a business area within the Sandvik Group providing solutions for virtually any construction industry application encompassing such diverse businesses as surface and underground rock quarrying, tunneling, excavation, demolition, road building, recycling and civil engineering. The range of products includes rock tools, drilling rigs, breakers, bulk-materials handling and crushing and screening machinery. In 2012 sales amounted to more than 9,700 MSEK, with approximately 3,300 employees (pro forma rounded numbers). The 160D is a diesel-powered, self-propelled, crawler-mounted rotary blast hole drill built to adapt to the toughest operating environments in the world. It can be operated by a single person and is equipped for drilling 160mm diameter holes in open cast mines. The drill is being offered to better meet the needs of Sandvik’s in-market customers. Sandvik Mining, a leading global supplier of equipment and tools, service and technical solutions for the mining industry, has rolled out the first 160D drill from its state-of-the-art facility in Pune, India. The milestone was celebrated at an event today at the Pune facility and was attended by industry leaders, as well as the Sandvik Group executive management team. The team, including Sandvik president and CEO Olof Faxander, is in India for a series of events focusing on Sandvik’s growth in India. The 160D is a proven model that has been successfully integrated into the Sandvik Mining equipment portfolio following the 2011 acquisition of surface drilling machines business from Eimco Elecon. The product is being manufactured at Sandvik’s facility in Pune, with design improvements incorporated to enhance the value delivered to end users. Globally, India is the third largest coal producer, the fourth largest iron ore producer and is among the top 10 producers of various minerals such as chromite, zinc and magnesite. As its population steadily climbs toward 1.3 billion people and global demand for resources grows, India will continue to invest in the technology needed to mine its valuable reserves. Optimized Power Delivery – Powered by a direct-injection, four-stroke diesel engine of not less than 200kW net power measured between 1,700 and 2,000 rpm. Efficient Hydraulics – Hydraulic pumps, motor and cylinder that are field proven and havebuilt-in protection from surge, cavitation, loss of oil due to hose leakage, burst, etc. Productive Operator’s Environment – Fall Object Protective Structure (FOPS)-certified cabin that is lockable, fully insulated for heat and sound resistance, and air conditioned for the operator’s comfort and safety. Powerful Drilling Mast – Raising and lowering of the entire mast is accomplished hydraulically with safety check valve/s to prevent falling of mast in the event of power or hose failure. Effective Dust Control System – Eliminates dust hazards to the operator and equipment. For more information on Sandvik Mining’s equipment and tools, service and technical solutions for the mining industry, visit www.mining.sandvik.com or like us on Facebook. Sandvik is a global industrial group with advanced products and world-leading positions in selected areas – tools for metal cutting, equipment and tools for the mining and construction industries, stainless materials, special alloys, metallic and ceramic resistance materials as well as process systems. In 2011 the Group had about 50,000 employees and representation in 130 countries, with annual sales of more than 94,000 MSEK. Sandvik Mining is a business area within the Sandvik Group and a leading global supplier of equipment and tools, service and technical solutions for the mining industry. The offering covers rock drilling, rock cutting, rock crushing, loading and hauling and materials handling. In 2012 sales amounted to about 37,800 MSEK, with approximately 14,000 employees. 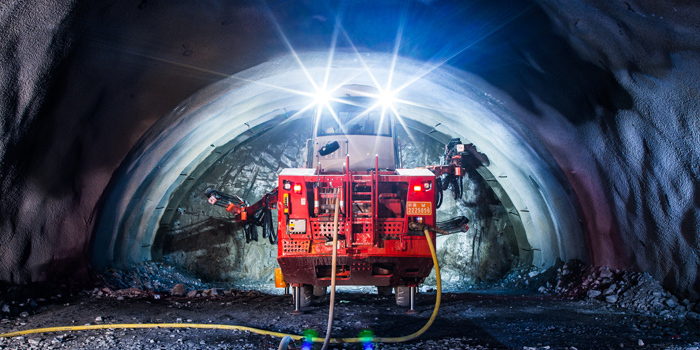 In 2008, Sandvik launched new intelligent tunneling jumbos, the Sandvik DTi series, to the first market areas. Ever since, the series has been a great success, fast becoming the industry-leader in optimized performance, outstanding excavation accuracy and low-risk operation in almost every corner of the world. Despite the successful receipt among the tunneling sites, further development of the DTi series is continuously on-going. Since the launch, the fruits of that work have brought into the machines additional practical features for accurate and fast tunneling such as WLAN remote access, iBOLT systematic bolting and total station navigation. Aspects of work site safety have been also carefully considered in the Sandvik DTi series, and the latest news include, among others, an Access Detection System that stops feed and rotation if a person is entering the working area of the booms. Other recently introduced features are high frequency RD5 series rock drills for optimized performance, and TIER4 engines. The new Access Detection System enhances safe excavation by decreasing risks caused by human actions and errors. The system includes detection sensors on the sides of the jumbo. If a person is recognized in the detection field, boom operations – rotation and feed - will automatically be stopped. In other words, access detection prevents anyone from entering the working area of the booms while they are in operation. If boom operation is automatically stopped, the system must be de-activated with a separate reset by the operator before drilling is released. In addition to the Access Detection System, the DTi jumbos also feature a manual prevention switch for boom and drilling movements. Safety needs have been considered in the mechanical structure of the jumbo as well, in the form of yellow marking in all access ways, steps, ladders and handles. In addition, the spiral hoses are made of fire-resistant material. All these features greatly improve the work site safety. Sandvik DTi series jumbos are equipped with new, advanced Sandvik RD5 series high frequency rock drills. The RD5 series features low profile height and a patented stabilizer with an intelligent control system that dampens harmful shockwaves. The simple body structure of the drills along with their modular construction and visual wear indicators guarantee ease of use and maintenance. Built to last, the robust and reliable drills feature only few pressurized seams between functional modules. With 15 - 20 percent higher penetration rates and significantly longer tool life compared to HLX5*, the robust and reliable RD5 series rock drills offer carefully optimized, cost-effective performance. The DTi series features a TRH rod handling system, offering an ergonomic and mechanized way of extension rod handling. With its low weight, compact, durable and protected structure and cabin control, it meets the specific needs of any tunneling works. In addition to this, a centralizing rod retainer SCR holds extension rods in place during coupling and uncoupling. It also keeps the rod centralized while clamping. The computer-controlled Sandvik DTi series jumbos are famous for their outstanding accuracy. They come in five different models for excavation of 12 – 231 m2 cross sections, including face drilling, bolt hole drilling and long-hole drilling. The DTi jumbos are designed for automatic use which translates into highest process repeatability and best possible excavation predictability. The user-friendly iDATA control system features full round drilling automatics, one hole drilling automatics and automatic boom positioning according to drill plan. The automatic functions also include boom self-collision detection and hole length control. The further intelligence features in the DTi jumbos include data collection of production and process information such as round data, cumulative production data and drilling parameters logging that, in turn, help production logistics planning, scheduled maintenance and productivity improvement. The DTi rigs are equipped with Sandvik iSURE® tunnel excavation management tool. This combination ensures optimized blasting as per plan, supplying better pull-out, decreased need for scaling, increased rock loadability and smoother collaring in the following round. * 40 % longer tool life for the shank and 17 % for the bits compared with HLX 5 in test conditions. Sandvik is a global industrial group with advanced products and world-leading positions in selected areas – tools for metal cutting, equipment and tools for the mining and construction industries, stainless materials, special alloys, metallic and ceramic resistance materials as well as process systems. In 2010 the Group had about 47,000 employees and representation in 130 countries, with annual sales of nearly 83,000 MSEK. Sandvik Construction is a business area within the Sandvik Group providing products, services and solutions for virtually any construction industry application encompassing such diverse businesses as rock quarrying, tunneling, rock excavation, demolition, road building, recycling and civil engineering. The range of products includes rock tools, drilling rigs, breakers, bulk-materials handling, stationary and mobile crushing and screening solutions and underground civil engineering drilling, cutting, loading & hauling machinery solutions and services. In 2011 sales amounted to more than 9,000 MSEK, with approximately 2,600 employees (pro forma rounded numbers). Sandvik Mining in South Africa is proud to announce that it has been selected by Royal Bafokeng Platinum for its new flagship platinum project, Styldrift, as the key supplier of underground production trackless equipment. Sandvik Mining in South Africa is proud to announce that it has been selected by Royal Bafokeng Platinum for its new flagship platinum project, Styldrift, as the key supplier of underground production trackless equipment. Phase 1 of the project generated a single order in the last week of December 2012 for 83 machines comprising mostly of low profile 8 ton LH208 LHDs, DD210-L drill rigs and the only fully mechanised roofbolter, DS210L-M. Delivery of the machines will take place during 2014 but various other projects like the related apprenticeship training programme, community “Up-skill” programme and the current Sandvik sponsored community day care project in the Boshoek area will benefit much sooner. Royal Bafokeng Platinum has tasked a contractor to do the Development work leading to the declines. The contractor has also been using the Sandvik DD210L drill rig to perform the Development. Sandvik would like to acknowledge the early commitment shown by Royal Bafokeng Platinum which we know will reap rewards for all stakeholders, including the local communities. Both parties believe that this is the beginning of a “valuable partnership." and not just the supply of mining equipment. Sandvik Construction is proud to announce that as of the 1 October, Pilot Crushtec is to be its new distributor for the Mobile Crushing and Screening product range throughout Southern Africa. Pilot Crushtec will not only be supplying a comprehensive range of Sandvik mobile equipment but will also be providing full aftermarket care, spare parts and dedicated customer service. Sandvik’s world leading ranges of construction equipment needs no introduction; but now customers throughout Southern Africa will be able to benefit from even greater levels of support through its new distributor, Pilot Crushtec. The appointment of such a professional and experienced distributor reinforces Sandvik’s commitment in providing even greater levels of customer focus, and further enhances its commitment to enhanced locally focused customer support, whilst at the same time allowing customers to benefit from dealing with a truly global company. Pilot Crushtec is an established name throughout Southern Africa, with offices, workshops, service engineers throughout the area. This will further enable customers to benefit from the specialized advice and assistance that has made Sandvik the world leading supplier of construction equipment. 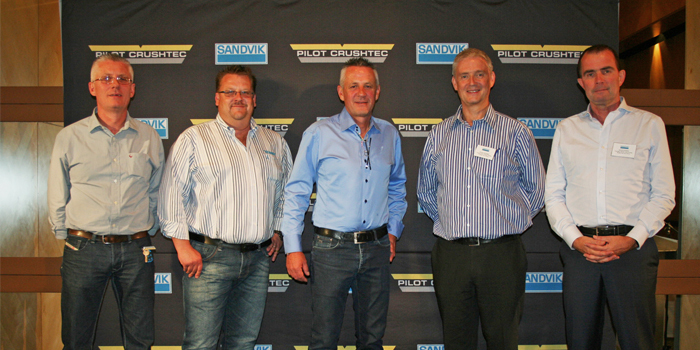 Pilot Crushtec was appointed Sandvik Construction Distributor on the 1 October, and all at Sandvik Construction offer them congratulations on becoming part of the Global Sandvik family. Sandvik Mining today announced that Sandvik Mining has started its Luoyang Technology Service Center project. Sandvik Mining today announced that Sandvik Mining has started its Luoyang Technology Service Center project. This center, once completed, will serve as a platform and window for Sandvik’s further development in Central and Western China. The project also marks Sandvik’s efforts to improve its strategies and its commitment to developing the Chinese market. Sandvik Mining Luoyang Technology Service Center will be established strictly according to Sandvik standards. With a total investment of more than RMB 100 million it is expected to become a world-leading professional mining and construction technology service center in China. It is the first multi-function operation base in Central and Western China including mining and construction technology service center, components maintenance and re-manufacturing center, components storage and supply center and technology training center. “Luoyang is one of the focuses of China’s efforts to rejuvenate the equipment manufacturing industry. It is also one of the fastest growing cities in Central and Western China, enjoying sound economy, resource and policy advantages. As a world-leading supplier of mining and construction equipment, Sandvik chooses Luoyang as the location for its Technology Service Center, which shows our confidence in the growth potential in the city and in Central and Western China,” said Christopher Wright, president of China and Northeast Asia at Sandvik Mining. Once completed, the Sandvik Luoyang Technology Service Center will be based in Luoyang, and provide service to a number of areas, including Henan, Hebei, Shanxi, Shaanxi, Shandong, Anhui and surrounding areas in southwestern and northwestern China and Inner Mongolia. Sandvik Mining is a business area within the Sandvik Group and a leading global supplier of equipment and tools, service and technical solutions for the mining industry. The offering covers rock drilling, rock cutting, rock crushing, loading and hauling and materials handling. In 2011 sales amounted to about 32,200 MSEK, with approximately 13,200 employees (pro forma rounded numbers). In the city of Irauçuba, in the Ceará state close to the equator in the northeast of Brazil, the Sandvik QA450 triple deck screener, QH330 cone crusher and QJ340 jaw crusher are taking an active role in the renovation works on the BR-222 motorway, which joins the cities of Fortaleza and Sobral. Baltt Empreiteira Transportes e Terraplenagem Ltda. and the company CAMTER, which is hiring the equipment from Baltt, are pioneers of this crusher and screener set up in the biggest country in South America. Founder and Managing Director, Rogerio Baltt, spotted a niche in the market back in 1980 and started up his own transport company in the Itajaí valley region, Santa Catarina. This same entrepreneurial vision took him to acquire a quarry in 2005, in a period where the country was fast consolidating its position as one of the second biggest emerging world economies after China. The success of his business saw his fleet grow from a single used lorry, to more than thirty lorries as well as quarry and road construction equipment, helping to boost the economy of the southern region of Brazil along the way. Among the main reasons for the acquisition of the three Sandvik machines are their productivity, mobility and design. The crushers and screener are track mounted and hydraulically driven, which allows them to work at the deposits along the BR-222 motorway. The units can be quickly relocated to a new area of the project as required, which makes them ideal not only for their flexibility but also for the cost efficiency of their quick set up. With the operator’s safety as priority, Sandvik units are designed and manufactured to all CE certification and safety standards ensuring ease of operation as well as peace of mind. The material being processed is granite. The blasted 600 mm material is first processed by the Sandvik QJ340 jaw crusher. The high crushing speed of its 1250 x 750 jaw, together with its reverse crushing action function, permits a continuous flow of product into the second machine on the train: the Sandvik QH330 cone crusher. At a 28 mm CSS position, the material is further reduced from 100 to 25 mm. 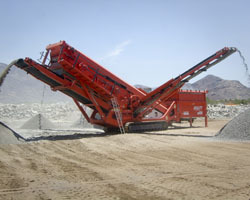 The material processed by the three foot Sandvik CH430 cone crusher fitted on the mobile unit, is of excellent shape and quality, thanks to the CSC (cubical shaped crushing) technique developed by Sandvik. Finally, the QA450 triple deck doublescreen, with a screening surface equivalent to a 20’ x 5’ area (6 x 1.5 m), produces -6, 6-12, 12-19 and +19 mm final products at a rate of 160 mtph (176 stph). The length and design of the four conveyors, allows a stockpiling capacity of over 5 metres and the possibility for it to be used in a recirculation mode with the QH330, with a potential to augment the quality of the final product even more. Rogerio Baltt is clearly impressed with this latest Sandvik acquisition from the Santa Catarina dealer, Jok´s Equipamentos para Mineração Ltda: “we are extremely pleased with this new Sandvik purchase. The machines are well built, easy to set up and operate, which in this remote area, is invaluable”. With the back up of Sandvik’s cutting edge technology and first class global after sales support, this set up is destined to be a hit. Sandvik is a global industrial group with advanced products and world-leading positions in selected areas – tools for metal cutting, equipment and tools for the mining and construction industries, stainless materials, special alloys, metallic and ceramic resistance materials as well as process systems. In 2010 the Group had about 47,000 employees and representation in 130 countries, with annual sales of nearly SEK 83,000 M.
Sandvik Mining and Construction is a business area within the Sandvik Group and a leading global supplier of equipment, cemented-carbide tools, service and technical solutions for the excavation and sizing of rock and minerals in the mining and construction industries. Annual sales 2010 amounted to about SEK 35,200 M, with approximately 15,500 employees.